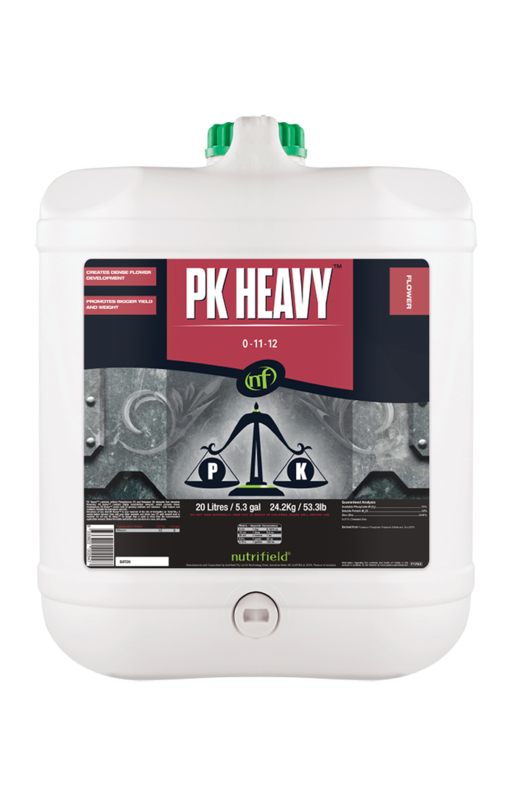 PK Heavy is a refined synthetic phosphorous (P) and potassium (K) supplement to support the plant’s increased PK needs during the flowering phase. Phosphorous is a key building block of the plant’s energy molecule, ATP (adenosine tri-phosphate), which is required to support the elevated levels of metabolic activities during flowering, such as photosynthesis and respiration. Potassium is involved in the movement of water and nutrients within the plant, and supports the increased requirements of the development of healthy flowering buds. The increased supply of phosphorous and potassium during flowering, supports the formation of additional flowering sites and promotes enhanced flower yield and quality. Nutrifield PK Heavy contains high levels of the macronutrient phosphorous (P), which is a key component of ATP, the chemical energy molecule in plants required to carry out metabolic activities. Flowering is a very energy intensive cycle of plant growth, which places a high demand on phosphorous (P) to fulfil the increased ATP requirement. The boost in phosphorous (P) from PK Heavy stimulates flower bud development, bud set, and blooming. 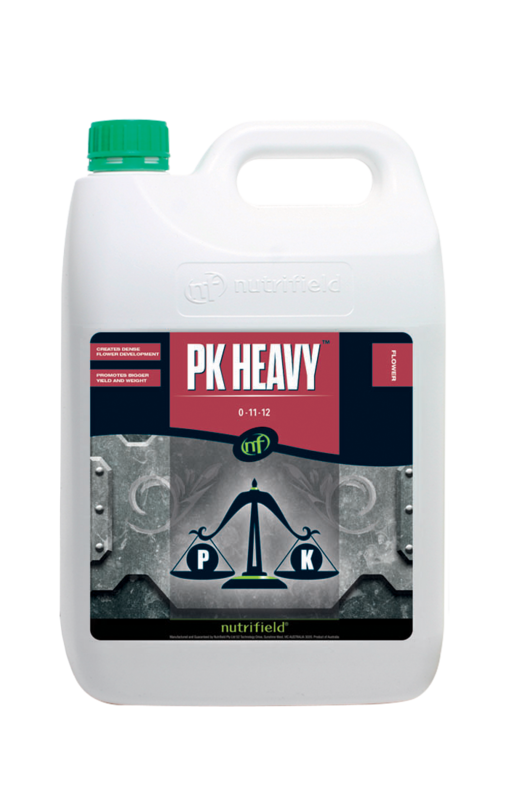 Nutrifield PK Heavy delivers high amounts of potassium (K) which facilitates the internal movement of nutrients through the plant. Nutrients are required as they are the building blocks for flower formation. Potassium is critical for the efficient movement of nutrients within the plant to the flowering sites where they are needed. The boost in potassium (K) from PK Heavy ensures stomata function correctly to prevent water loss and ensure sufficient CO2 is available, as these are critical during photosynthesis.